There are some gardens that seem to look a little put together with too many disjointed elements and a mish mash of live and dead plantings. Often this is due to poor planning, a lack of understanding of what plants will thrive where and improper care. If you have an outdoor space you would like to transform from a messy backyard into a lovely garden it is important to consider the different design elements that make a space aesthetically pleasing. If you don’t have the budget to work with a professional landscaper for the whole job you can consider working with them to come up with a plan and assist with plant recommendations that will be well suited to your location. One of the mistakes novice gardeners make is to get too caught up in choosing plants that look good and not considering how they will work together once planted. As well to create unity it is important to consider everything. You have to look at the other elements in your garden including the style of your home, features such as slopes or built in planters, water features and existing plants that you would like to keep such as perennial beds, trees and bushes. It isn’t until you consider your surroundings that you can actually create unity between old and new. It is also important if you are planning a front garden as you want to look at your street, your home, the space and other gardens so that you create a garden that will work well within your neighbourhood. It is okay to be unique, but you should consider balance for the overall neighbourhood as opposed to creating an over the top garden that will stick out like a sore thumb as opposed to looking like it was created by a green thumb. You use the lines of your garden to define your overall design. 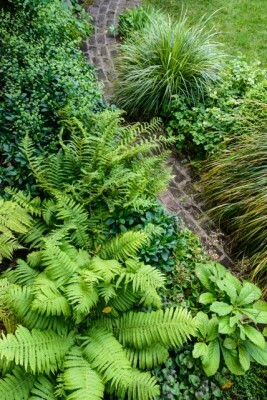 It will be the visual effect that makes a garden look big or small as well as delicate or chunky. You can look at lines when creating garden beds and paths as well as what you want to use to separate space such as hedges or flower beds. You can decide to have everything straight and angular or add curves and circles. Form then adds details such as water features or a pretty seating area beneath your favourite tree. You can use colour to create contrast or go for a more subtle look using tone on tone or whites and green. You can then add texture by looking at things such as stone paths or terraces, wood or stone retaining walls, the textures on your home such as stucco or brick and interesting trellises made of wood or metal. Colour can also add texture in multi-coloured beds, variegated leaves and planting different types of grasses. All of these things must be considered in hand with using the right plants in the right soil and climate as well as where the best sunlight or shade will allow them to thrive.